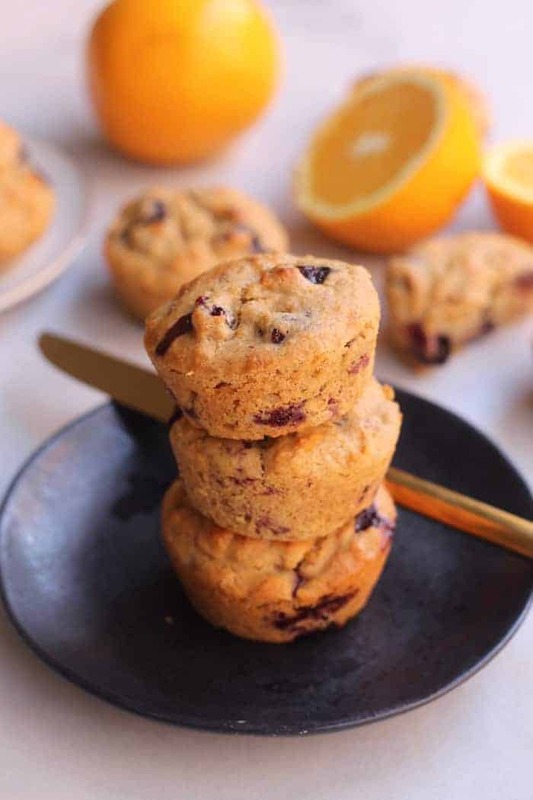 Tender, moist, and sweet, these lightly sweetened healthy Blueberry Orange Muffins are delicious for breakfast or as an afternoon pick-me-up! An easy, kid-friendly, vegan-friendly recipe. The truth is that I really wanted to make you guys n’ gals bread. Like a real tall, cloud-like, hearty loaf of sorts chock full of bursting bloobs and bright orange citrus sweetened with just enough maple syrup to sweeten. Cuz lezbehonest…if you’re anything like me, you’re gonna slather these babies with salted buttah and a drizzle of honey the second it comes out of the oven and be all ohhh ahhhh I feel like I just had a baby but it’s actually just blueberry orange bread that I love so dearly. Bread was the intent, but muffins were far more realistic. We’re talking eighteen minutes versus like sixty plus, ya feel? But if you feel so inclined as to turn this into a loaf that you can slice into gorgeous thick pieces, feel free to use a loaf pan and bake it for about an hour. Send me selfies with it!! These muffins are straight up perfect. Fluffy and moist and tender and sweet like you stepped right out of muff heaven. I mean it when I say you just have to try one with butter or Earth Balance and honey. 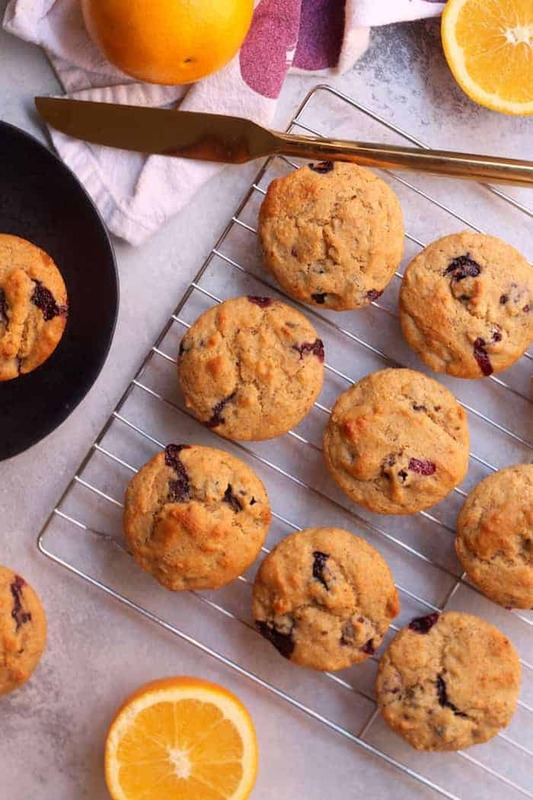 I’ve posted many a muffin recipe on this site but I gotta hand it to these…they’re my all time favorite. 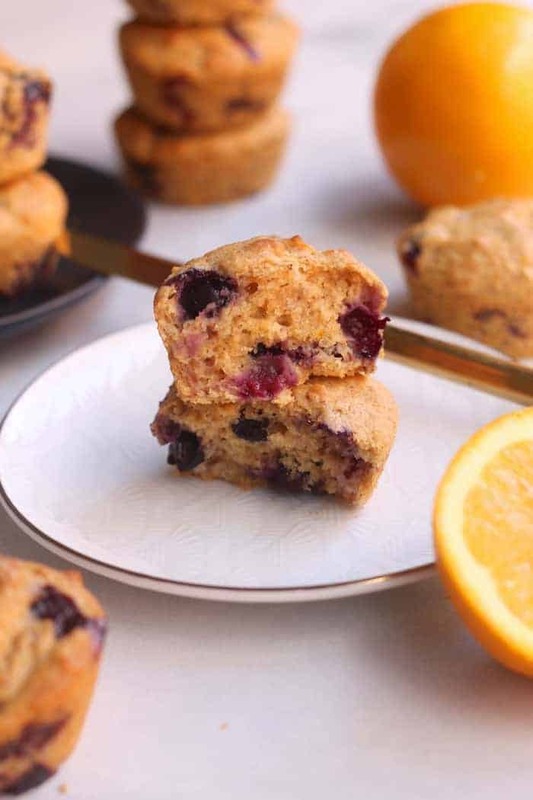 Now there’s a couple little tricks with this blueberry orange muffin recipe. First, tossing the bloobs in a bit of the flour mixture prevents them from sinking like sad little blue anchors in each muffin. Miraculous! Second, you want to use fresh oranges here. Normally I’d be all about ease but taking a minute to juice and zest the orange is where that divine citrusy flavor comes from. During the months of June to October when US citrus isn’t in season, Summer Citrus of South Africa saves us with their sweet and seedless Easy Peelers, Cara-Cara oranges, Midknights, Star Ruby grapefruits, and Navel oranges. And now for a lovely GIVEAWAY! One lucky reader will have a chance to win this awesome Swing Into Summer prize pack. Click HERE to enter! Now back to the recipe! So I used a portion of whole wheat flour and a portion of unbleached all purpose so these were light and fluffy as opposed to dense. I highly recommend! I also chose to do 1/2 cup of pure maple syrup in the first batch and they tasted more like a less sweet breakfast muffin. Still yummy, but likely not sweet enough for most taste buds. Feel free to use whatever suits you best. I thought the olive oil would add another layer of fruitiness and fanciness, but any oil will do. It never ceases to amaze me how delish blueberries are paired with just about anythingggg. Blueberry orange stir fry coming your way next week hayyyyy! Preheat oven to 400F. 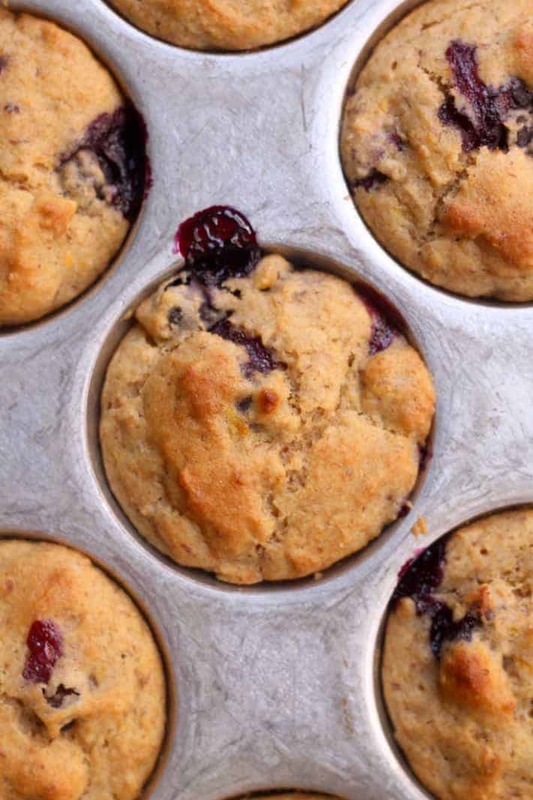 Spray a 12-cup muffin tin with cooking spray. Place ground flax and water in a small bowl. Stir and set aside. Measure flour by spooning it into the measuring cup and leveling it off. Combine flours, baking powder, and salt in a medium bowl. Place blueberries in another bowl and toss with 2 tbsp of the flour mixture to avoid sinking. In another mixing bowl, combine flax mixture, maple syrup, olive oil, yogurt, orange juice, orange zest, and vanilla. Fold wet mixture into dry mixture until just combined. Don’t over-mix! Fold in blueberries. Spoon mixture 3/4 way full into greased muffin tin. I baked the extra batter in a small dish for a little breakfast bake! Bake for about 16-18 minutes or until a fork comes out clean. Cool for 20 minutes before carefully transferring muffins to a wire cooling rack to cool completely. I like serving mine with butter or Earth Balance and a drizzle of honey! This post is sponsored by Summer Citrus of South Africa. Thanks for supporting the brand that make Hummusapien possible! The muffins look SO good. I love oranges and blueberries, and combining them together sounds like a great summer treat! Love this flavor combo! I love citrusy in the morning and never thought to try these two together! Yum! never thought to toss bloobs in flour beforehand! Thats a good trick to know! This looks amazing, but I’m impatient and don’t have any oranges — if I take the juice out, will I need to reduce the flour as well? Thanks for any suggestions, as well as for the recipe! Hey, Martha! I wouldn’t take out the OJ or reduce the flour–you could use almond milk instead of OJ but the muffins won’t be nearly as flavorful without the OJ and zest–I’d hold off until you have oranges :) Worst case, use almond milk instead of OJ and add cinnamon or some other yummy spices! I have no time and no ingredients, but I gotta try these sometime soon, they look great! These sound delicious. Can I replace the fresh blueberries with frozen? This was my first time using flax eggs. I followed the recipe as directed, except I used 1/2 cup honey instead of the maple syrup. They tasted delicious–I love the blueberry + orange combo! The first muffin I tried too soon, and the texture was a little gummy. After they had cooled completely, they were great–slightly denser than muffins with eggs. The second day the muffins had dried out just a little bit–I think I will freeze leftovers if I make them again, or maybe try adding a bit more oil–and they also tasted sweeter than the day before. I just made these muffins yesterday and they did not disappoint! I was in a bit of a time crunch and wasn’t able to juice my own oranges for this recipe, however, store bought juice worked wonderfully! Thank you for always providing the best–naturally sweetened–muffins evaaa! !